Getting into the World Cup spirit! 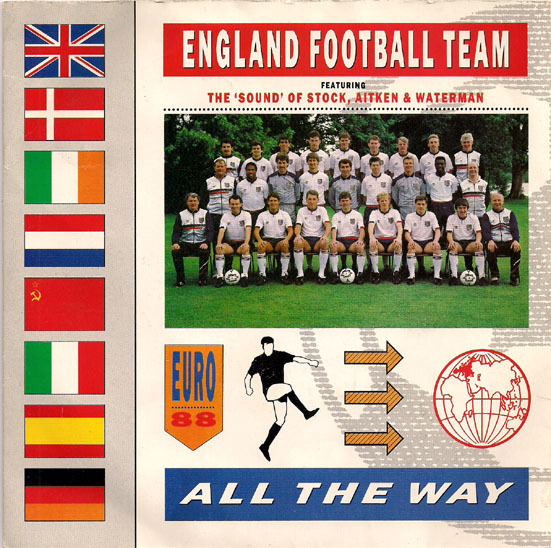 Touched by the hand of SAW (Scott,Aitken & Waterman) for the Euro 1988 Championship this is pretty dire. No soloists, no rapping, no sampled commentary, it sounds just like every other SAW record, programmed synth pop; Pete Hammond even gives it a remix ! BTW England’s main sponsor for this was Trebor’s Extra Strong Mints! I’ve included the promo vid that includes the baby faced , Gary Linekar along with the not so baby faced Peter Beardsley, oh and Tony Adams drink driving! Did they go all the way………No! Strictly for nostalgia purposes only! !